This is: the world’s first Barber Pole Through-Zero Flanger. 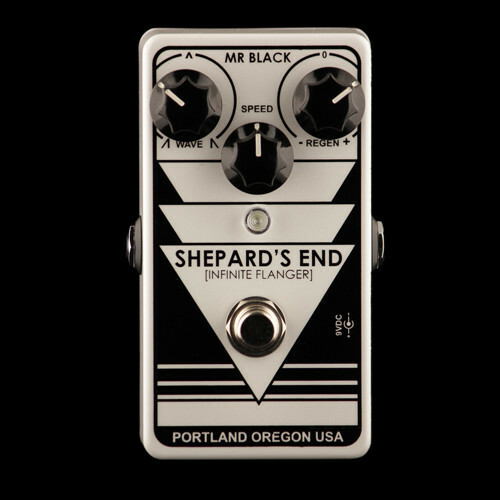 Well, essentially, the Shepard’s End is a flanger, but its unlike any flanger you’ve ever heard, played or experienced. While the term “Barber Pole” sounds neat-o-speed-o, what it really means is that this flanger does not have a beginning, or an end to its cycle. WHAT?! You know how most flangers go up, then back down? Well, this one doesn’t do that. Nope. It goes up, continually. It goes down, continually. It can even go through the zero-point (that amazing over the top wooshing sound you hear on so many records), continually. This just depends on how you set the controls. And they’re pretty easy to use. As if that weren’t enough, you get both positive (swishy, phaser-y sounds) and negative (tubular, hollow, sucking-into-itself sounds) regeneration control. Or, just raw through-zero flanging at its finest as you have heard on so many recordings.